It was a sensational phenomenon and we were all thrilled to see 14,535 raptors migrating past Mt. Wachusett on September 15, 2013. This was a day that we all dream about! It was literally a river of Raptors to be sure! The huge push was from around 11:30 AM to 1:30 PM, but who had the time to look at our watches!! That is just a guesstimate. The birds were EVERYWHERE! We did get some kettles in the afternoon, but not with the intensity as we had earlier in the day. Paul Roberts, Steve Olson, Dave Goodine and I were joined by many hawk watchers, and visitors who were mesmerized by this wonder of Nature. There were many oohs and ahhs heard as the birds flew past, some at, and below eye level. The kettles were breathtaking with hundreds of hawks in each one, utilizing this method of flight. As they began to peal off, the streams appeared like an armada leaving to continue their journey in search of the next thermal. 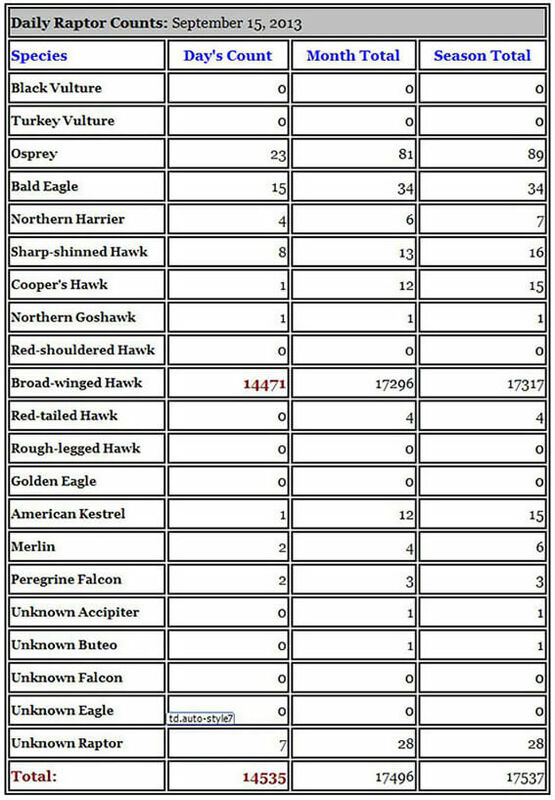 Please check out Hawkcount.org for the details on species and numbers seen. Paul said that it was the 4th largest Broad-wing flight in Eastern Massachusetts. The last impressive number was 24 years ago. WOW! Many hikers and visitors were amazed at the spectacle before us. I ran around passing my binoculars to anyone who wanted to see the birds. The smiles on their faces indicated how astonished they were. Well, just wanted to share this good news with you. Tomorrow may be a good day, so we are going back for more, one can never see too many Hawks! Weather: Temp-mid 50s to high 60s by the pm. Wind was light from W with shifts to SW & NW. Had little effect on the migrating birds. Sunny with clouds. Visibility very good. At least 75 miles all around. Boston, Western MA, Northern NH, and Vermont all clear. Some haze on lower horizon. Observations: The fifth largest Broad-winged hawk migration in a single day in the past 24 years. Outstanding! Many Bald Eagles- 8 mature birds and 7 immature birds. Non-raptor Notes: Sapsucker, Juncos, Towhees, Ravens, & lots of Commorants. Visitors: Bessie Kim & Jack Mammone, George & Judy Gove. OBSERVERS: Jane Sender (1st time on Wachusett), Marcus Rhodes, Jenifer Glagowski, Judy Davis, Ann Smith, Sandy Shepard, Katherine Chihowski, Sam Miller, Kathy Olson,Ursula & David Goodine, Paul Roberts, Rod Chase, Steve Olson, Jackie Boucher. Vistors to the Summit were treated to a display of Raptor activity not seen in years. A fantastic day for all. Next Day Forecast: Iffy! Possibility that there may be showers in am. Overcast during the day. Winds from the NW. Have no idea on how high or low the ceiling will be. We’ll find out in the morning.